There are several accounts of the first spiritual meeting between Mevlana Rumi and Shams Tabraiz, as seen in our earlier post. 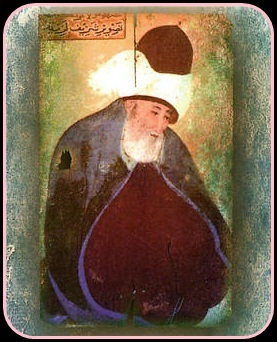 Shams was an accomplished mystic, whereas Rumi was renowned as a great religious scholar of his time. Shams immediately won Rumi’s heart via his ability to bend the laws of nature as he destroyed Rumi books on Fiqah and reinstated them. However, Rumi was wise to know that such feats were merely acrobatics in absence of real spiritual knowledge. He asked, “Hazrat Bayazid Bastami , one of the greatest of mystics, proclaimed Subhani Aazam Shanee i.e. how great is my glory (of spiritual station) in Tusawaf. Yet Prophet Muhammad SAW did 70 istaghfars every day. How can we align such statements since by logic these (naozibillah) show superiority of Bistami over Muhammad SAW”. When Rumi heard this, he realized he has found the spiritual mentor he has been seeking for long. Download here the largest collection of Sufi Whirling [Sema] from Ensembles of Turkey and Egypt.